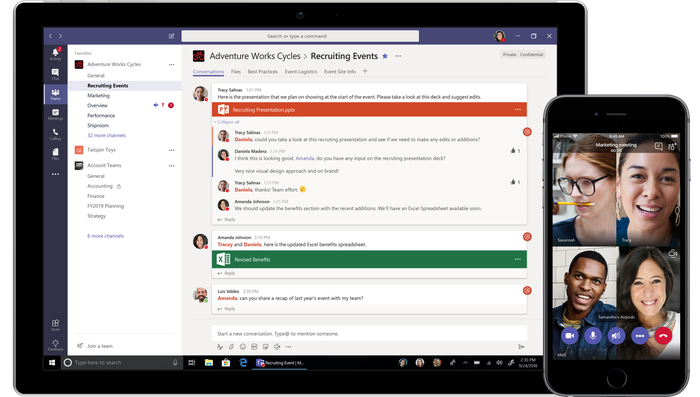 Microsoft has launched a free version of its collaboration app Teams, which can be used without an Office 365 subscription. Teams was launched at the start of last year as a direct competitor to Slack, which has offered a freemium version of its product from the outset. In March last year Microsoft made Teams available to all Office 365 subscribers with Business Essentials, Business Premium and Enterprise plans. “We recognised not everybody is on Microsoft 365 today, or yet, and so it’s a really exciting step for us in offering a free version of Microsoft Teams globally. Comparing it across the market this provides the most generous free version,” Ian Heard, Microsoft Australia’s modern workplace lead, told Computerworld. Heard denied that the freemium move was a result of underwhelming adoption rates. “Microsoft Teams has had some really strong market traction here in Australia. It’s actually been a real success story for us in terms of customer adoption. The main thing we want to do with the freemium is expand it out even wider. Initially when we launched it to market we wanted it very much centralised around the Office 365 tenant,” he said. The free version of Teams can be used by up to 300 people in an organisation, and offers unlimited chat messages and search, audio and video calling, 10GB of team file storage plus additional 2GB per person for personal storage and unlimited app integrations. “The idea now is to go out to a wider group and make it more readily available, and for it to be the new standard for modern working out there in the market whether you have Office 365 or not. This extends the reach of teams,” Heard added. The freemium offering boosts the appeal of trying Teams in a market so far dominated by Slack. The move is expected to “negatively impact Slack in the future,” industry analysts said. In May this year Slack revealed its platform had more than eight million Daily Active Users (DAUs) across more than 500,000 organisations. Of those, some three million are paid users, forming more than 70,000 paid teams, many of which have multiple thousands of active users. According to the company, that represents double the number of paid and daily users Slack had in the last quarter of 2016 making it the “fastest-growing business application in history”. In April Slack unveiled a raft of new security and compliance features aimed at boosting the appeal of its year-old Enterprise Grid product among IT leaders and admins. By comparison, at last count in March Microsoft Teams was used by some 200,000 organisations (up from 125,000 in September last year) significantly fewer than Slack. “I can’t dig into specifics around the Australian marketplace, but it’s really exceeded all expectations from our side,” Heard said. Facebook had 30,000 businesses using its Workplace offering (among them NBN Co) as of October 2017. Numbers for competitors like Google’s G Suite and Atlassian’s Stride (made publically available in March) have not been made publically available. Speaking to Computerworld in May, Slack CTO Cal Henderson said that whatever Microsoft did around Teams, Slack will remain a success. “Definitely they have the advantage of massive distribution and a massive salesforce, but what we've increasingly seen over the last decade is that most enterprises are a Microsoft customer because they need Excel and maybe they need Outlook, but that hasn't stopped the rest of the SaaS world from continuing to grow and grow,” he said. “The landscape has opened towards multi-vendor software delivery. I think that definitely gives us a chance to be successful,” Henderson added. Besides Slack had an edge on Microsoft by being the first mover in the market, and having a greater focus on daily usage Henderson said. “Our goal isn't to get an enterprise to buy a bunch of licenses, it is to have everybody at the company use it every day to get their work done…That’s not the default stance of most enterprise software makers,” he said.